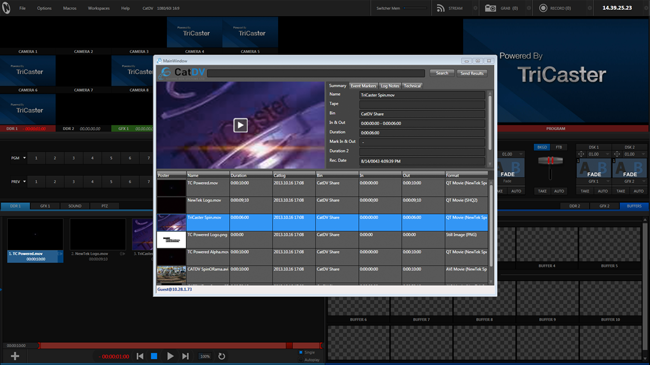 CatDV for TriCaster runs CatDV directly on a Newtek TriCaster and brings metadata management to this leading live Production and publication solution. 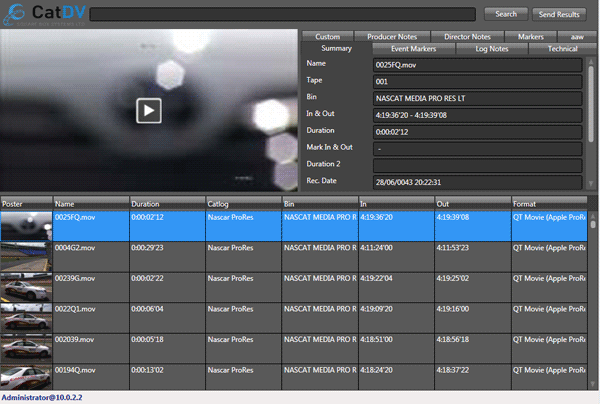 Users can search the CatDV database and bring assets into the TriCaster for play out etc. The plug-in is available as a free of charge update for all CatDV Web licensees. Click “Exit to Windows” located under Shutdown to get to the Windows Desktop. In CatDV Server Control Panel, in the Path Mappings tab of the Server Config screen, you will need to create a set of path mappings to allow CatDV Server and the Tricaster to find the proxy and original (CatDV Server 6.9 and above) media. In the proxy paths section you need to add rules that map between the original media path (the path shown as Media Path in the Media tab in CatDV) and the location of the the equivalent proxy media as seen by the server. These mappings are used by CatDV Server to locate the web-streamable proxies that allow users to preview the media in the Tricaster Plugin. In the hi-res media path mappings panel (CatDV Server 6.9 and above) you can set up addition rule that map between the original media path (the path shown as Media Path in the Media tab in CatDV) and the location of the high-res media as seen by CatDV Server and the Tricaster itself (if these are different you will need multiple rules). These rules are particularly useful in a mixed Mac/PC environment where the original media was imported on a Mac, and therefore has a Mac-style path such as /Volumes/SAN/Media… but the Tricaster needs to access the media through a Windows style path such as \san-serversanmedia. In this case a single rule of the form /Volumes/SAN/Media -> \san-serversanMedia would be required. Start CatDV for TriCaster while in a TriCaster session by holding down the CTRL key and clicking the“+” (Add media) icon in the DDRs, GFX bins, etc.. The CatDV for TriCaster panel will appear (initially empty). Media must be accessible to the CatDV server and the TriCaster with the same path so that hi-res media can be shared between the two systems. This means that hi-res media must be stored on a central shared storage device that both TriCaster and CatDV can see. CatDV for Tricaster v1.0.1 can run on any CatDV 6.9 Server (mac or Windows) as long as the original path mappings are configured as above.